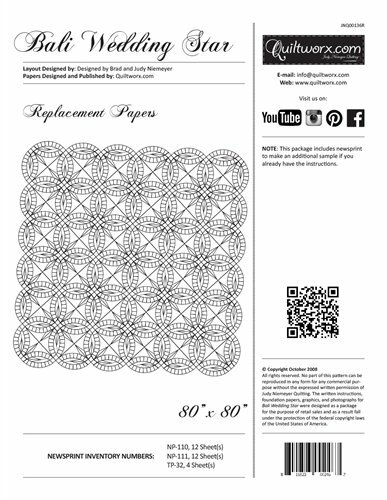 HOME > Judy Niemeyer Quiltworx > Bali Wedding Star Replacement Papers 80" x 80"
Bali Wedding Star Replacement Papers 80" x 80"
The Wedding Star pattern was designed for foundation paper piecing in 1996 by Bradley and Judy Niemeyer and redesigned in 2008. 2014, 2016, and 2018! This Quiltster compatible popular design uses 2-1/2″ Strips to create Ring Sets, foundation paper piecing for a perfect piecing outcome, there is a Creative Grids ruler available to assist with Curved Trimming, and it is a classic in the Quilting Industry. Extra foundation papers, acrylic rulers, and digitized quilting designs are available for this pattern as well.